There's a restaurant, Maialino, in New York City that I've heard great things about. I haven't had the chance to eat there but honestly, there are so many amazing restaurants in NYC that it's impossible to keep up. Specifically, I heard a lot about Maialino's olive oil cake and the recipe is available at Food52. I remember seeing the recipe and being interested but ultimately passing on it because...well, it's hard to explain but in that moment, it seemed like almost too much cake. It called for a lot of olive oil and I just thought it might be a treat best saved for eating out where you can savor a slice with your mate. I still haven't made it to Maialino but now I have a good idea what their signature cake tastes like, thanks to David Lebovitz! 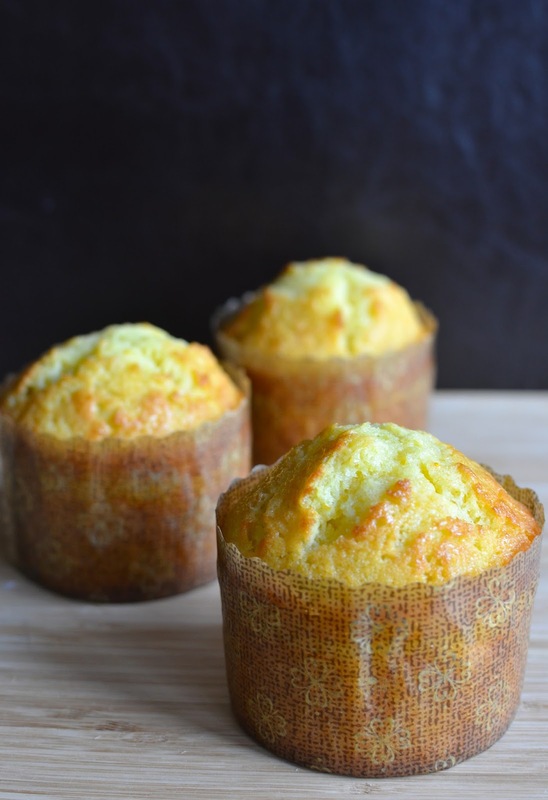 Instead of cake, it's in muffin form (individual cakes we can justify eating in the morning - even better! ), which is also how it's available at the restaurant. 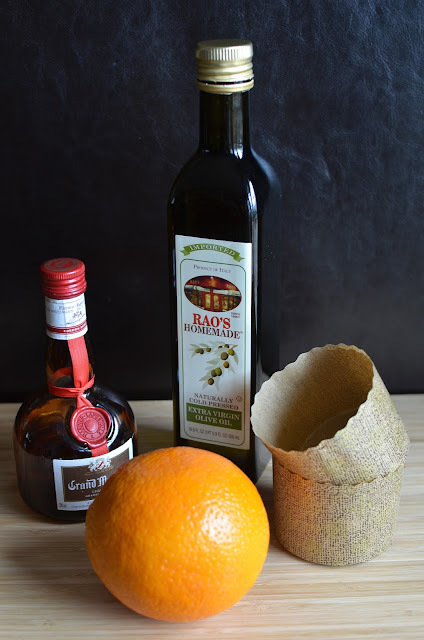 It's just what I'd been looking for without realizing it - a small scale recipe! Apparently, David had brunch there recently and the olive oil muffin made an impression on him so he took the cake recipe available at Food52 and reworked it into muffin form. All I can say is...thank you, David! Now I totally get what all the raves are about. These muffins are really good. You might look at it and think it's just another muffin but truly, it exceeded my expectations. 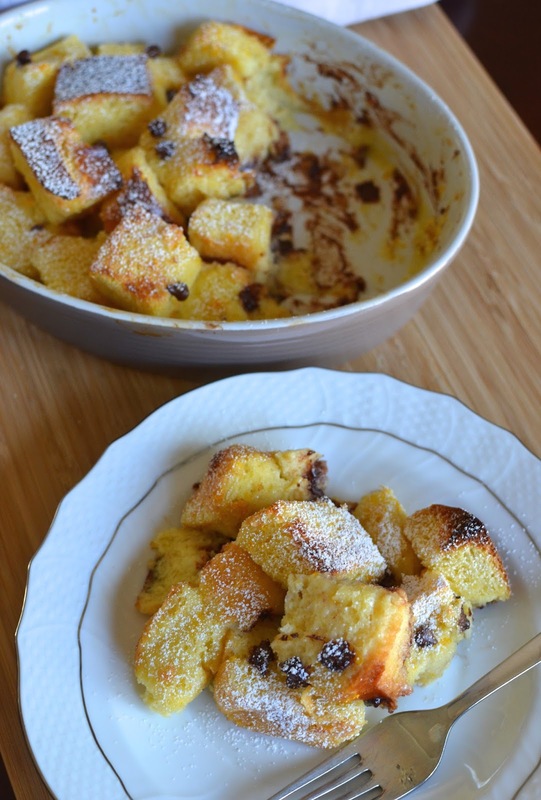 They're moist and flavorful - with fruity extra-virgin olive oil and a flavor of orange, as the batter is infused with fresh orange zest, and a combination of orange juice and Grand Marnier liqueur. You end up with a full-bodied cake/muffin that has a great mouthfeel in every bite. My husband and I were both surprised by just how good it was. Baking the muffins in these paper muffin molds mimics how they arrive at the restaurant. I love these baking cups and I'm seriously thinking I need to find a good bulk source because not only are they great to use in a practical sense, they make your muffins and cakes look pastry-shop ready! The paper molds I used are slightly larger than the ones David uses so for a half recipe, I ended up with 3 muffins (instead of 4). One made a perfect size for breakfast though you don't want to stop eating at all. I can tell you they stayed lovely and moist the next day so next time I make these, I will bulk up my output. It amazes me that after more than 500 posts and all the recipes I've attempted in the last few years, there are still so many times I find myself saying/thinking, "this is something I've never tried before...". I probably shouldn't be all that surprised but it's a constant reminder that there are endless things to explore and have fun with. And it can be a very simple thing, like putting cornflakes into cookies! We usually don't have cereal in our house. My husband isn't a fan and the little guy is not into eating cereal in the traditional way - i.e., with milk. He'll pretty willingly have it along side milk but not together. So cereal isn't a morning routine but a few weeks back, I bought a box of cornflakes to make baked cornflake-crusted chicken. I've wanted to make it for ages but never have cornflakes on hand. I finally decided to just buy a box for the purpose and while my son has been enjoying occasional bowls of cornflakes with a side of milk, I had plenty left to experiment with...so why not make cookies! You know what? I kind of loved it. 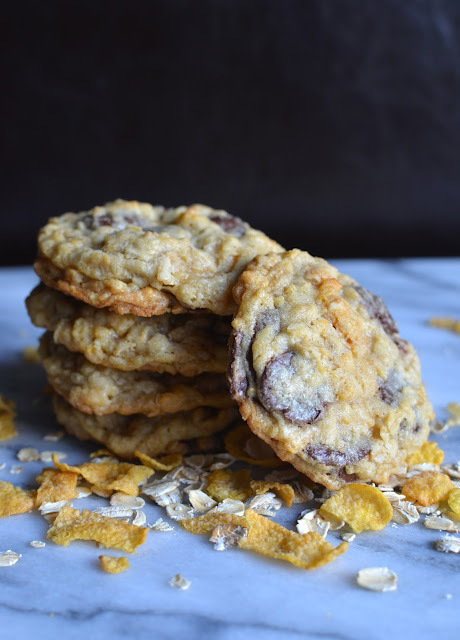 Oatmeal chocolate chip cookies with crushed cornflakes thrown in turned out to be a very good thing. My family and I devoured our batch of cookies. The cornflakes added a mysterious little crunch and slightly sweet-caramelized flavor that was really enjoyable. I found it's key to add the cornflakes and mix it fairly well into the batter so that the cornflakes break up and crush into small pieces. In one of my cookie bites, I had a lone large piece of cornflake and I just thought it was too hard, too large somehow, while the crushed bits melded rather perfectly into the cookie. This was a tasty experiment. Making use of my cornflakes was a great excuse to bake a batch of cookies! These have the whole chewy, crunchy, melty elements all taken care of in one. Now that I've tried this, I'm eager to try it out with rice krispies instead of cornflakes. It's yet another thing I haven't done but have been curious about. Honestly, there are endless reasons to make cookies, which is not a bad thing in my book! I made a cake to celebrate a special anniversary! Five years ago today, I hit "publish" on my first post on this blog and here I am today - still baking, cooking, learning, snapping, writing, and sharing here in my own small way. Five years of anything seems like a big deal somehow. In this instance, it means over 500 recipes and corresponding posts; it means a lot of playing in the kitchen, and a lot of learning (not to mention, eating). The beauty is I've barely scratched the surface though in the last 5 years, I've tried and learned so much. This picky eater is no longer all that picky, and for that alone, I'm grateful. In the last year, there have been moments of blog fatigue but then something new I haven't tried, some craving, or a new recipe will inevitably spark my interest and I'm back at it. 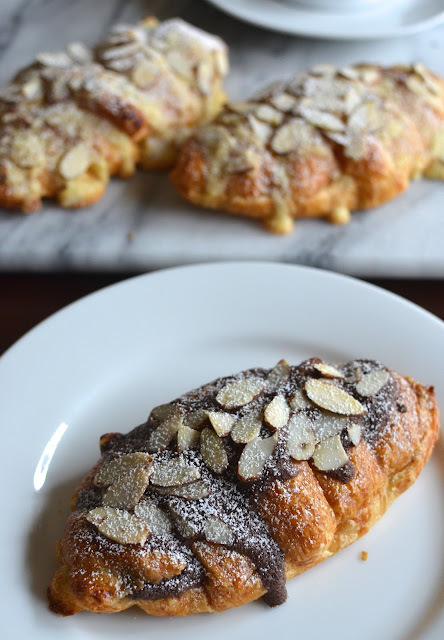 This little blog continues to motivate me to try things out in the kitchen. That, in turns, creates moments and memories with my family as we sit around the table. I love making food, like creating a blog post from nothing, and that is still true today, five years after I started typing. Ultimately, I just feel very lucky - lucky to be able to indulge in my hobby. I'm going to continue to be a student in the kitchen, cooking and baking away, reporting back on some of those experiences here for as long as the urge continues. I'm also particularly thankful for my husband, to whom everything always sounds good. He's always eager to eat what I cook up - regardless of how it turns out - and offer words of praise and encouragement. The little guy must learn from dad because he's much the same way (at least when it comes to things he likes to eat). And last but not least, thank you for spending a few moments here once in a while, looking around, maybe mentally comparing notes with me, and not taking me too seriously. To those of you who often share words of encouragement, I truly appreciate it! But wait...we need to cut the cake! The cake seems to be a bit of an afterthought today but it's symbolic for a celebration and I wanted to make one as the backdrop to this anniversary post. 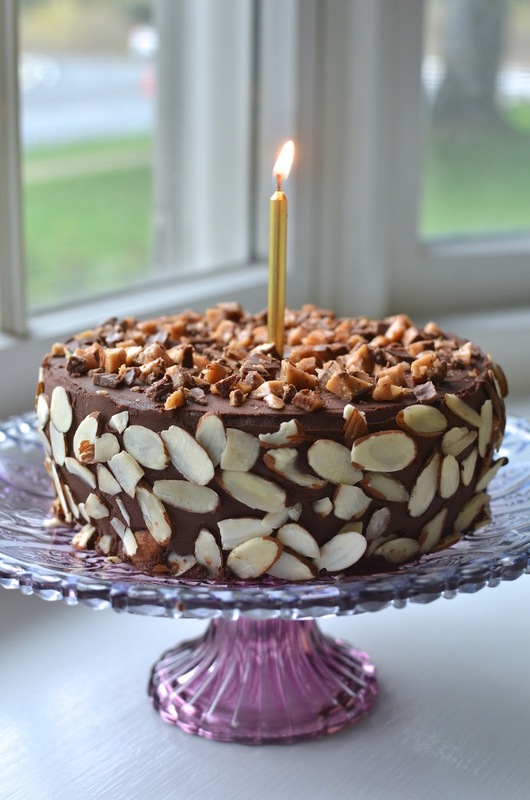 And for this occasion, I made what I'm calling a "chocolate almond torte". Frankly, "torte" may not be the right word here. To me, this cake looks like a torte, which I associate with small, short layer cakes featuring some kind of rich chocolate coating. Tortes are usually rather rich, however, and while this cake is filled and coated with chocolate ganache (I choose to use a water-based one), the layers are actually sponge cake, which is quite light since there aren't any fats in the form of butter or oil involved. This cake is flavored with cocoa as well as vanilla and almond extracts, and the layers were brushed with an amaretto syrup for added flavor and moisture. I wrapped the cake in some sliced almonds and topped it with toffee bits. That's my way of saying, Happy Anniversary, this year. I read...and I was drawn into her narrative. When I finished reading, I was feeling this mix of emotions - sad, glad, scared, frustrated, and all kinds of things in between. I wanted to comment on the post, tell her that her story affected me, but I sat there, not really knowing what to say. I sat quietly at my desk for a while. I was trying to wrap my head around her story but one thing was clear: it inspired me and I knew there was something constructive that I could do. I could bake the buttermilk cake. And that's what I did a few hours later that day. 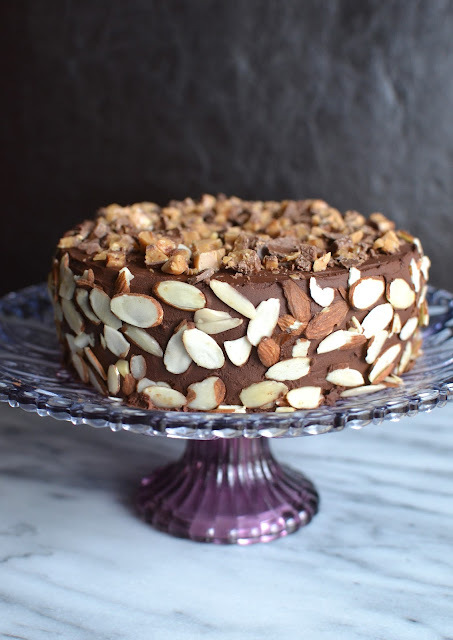 When my 10-year old son came home from school that afternoon, I told him about how I read this blog post that morning and it inspired me to make this cake. I served him a slice, then I essentially read the blog post to him while he ate. We had a good little conversation over this cake. And when my husband came home, I shared a slice with him and told him how we came to be eating this buttermilk cake today. So thank you, Erika, for sharing your story and for this delicious buttermilk cake recipe to go with it. Food does so much for us. And good food is ever more meaningful with a story behind it.